An audacious 85th-minute free-kick from Ramsbottom United’s Jermaine Wright condemned Tadcaster Albion to a 2-1 defeat in their opening Evo-Stik Division One North fixture of 2017/18. Brewers striker Tom Corner had earlier cancelled out Wright’s opener, before an outrageous set-piece strike in the dying embers sent Michael Morton’s men home empty-handed. Boss Morton came into his first competitive game in charge of Tadcaster without the likes of Danny Frost, Sam Akeroyd, Corey Roper and Jason Mycoe. He was however able to give new signing Cameron Murray a start along with midfielder Jake Ellam. The game did not begin well though, and Albion fell behind early on as the home side broke the deadlock with the season just seven minutes old. A pass in behind right-back Aaron Hardy looked to have been retrieved by the former Huddersfield Town defender, but Wright persevered, came away with the ball and slotted into the back of the net. Taddy had a decent chance of their own to draw level four minutes later when Andy Milne set Aiden Savory away in behind Rammy’s back-line, but the former Farsley man couldn’t find the target. The Brewers certainly grew into the contest and kept the ball better as the half went on but there wasn’t much between the two teams with few clear cut openings. The Rams did however spurn a glorious chance to double their lead in the 34th minute. Albion appeals for a high boot were waved away by the referee and as the protests continued Tom Brooks dragged wide of the goal from close range. After a high number of niggly fouls and soft free-kicks, Morton’s men did then level matters five minutes from the break. Conor Sellars’ deep curling free-kick was nodded down by Andy Milne and poked into the net by Corner to open his account for the campaign. There were no more goals before half-time, but with the sun continuing to shine down on the Harry Williams Stadium, Taddy were gifted an opportunity to take the lead early in the second period. A loose header back by a United defender allowed Savory in on goal, and he did well to control and get his shot off while under pressure, but gloveman Martin Fearon thwarted the effort. The sides couldn’t be separated, and with chances falling at both ends, Rammy’s Greg Daniels tried his luck twice in the space of minutes, just after the hour-mark. First of all the home number 10 curled harmlessly over the bar before doing well to get a shot off in the area, but without troubling Ingham. Albion substitute Josh Greening came off the bench in the hope of producing that bit of magic required, and he had a chance to win the game 12 minutes from time but he couldn’t generate enough venom in his shot to seriously test goalkeeper Fearon. There was however to be a third goal in the game and it was the home side that got it with five minutes to go. Wright stood over a free-kick five yards in from the right-hand touchline and the former FC United of Manchester man whipped a stunning effort over the wall and in off a post, catching Taddy stopper Ingham out. 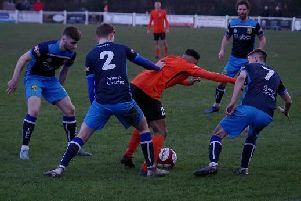 As the Brewers pushed for an equaliser in stoppage-time, Ramsbottom were reduced to 10 men as Max Hazeldine caught Ingham late and was shown a second yellow card. There was to be no late equaliser for the visitors at Rammy this season though but there will at least still be plenty of positives for Morton to take into Tuesday night’s home opener against Ossett Albion.